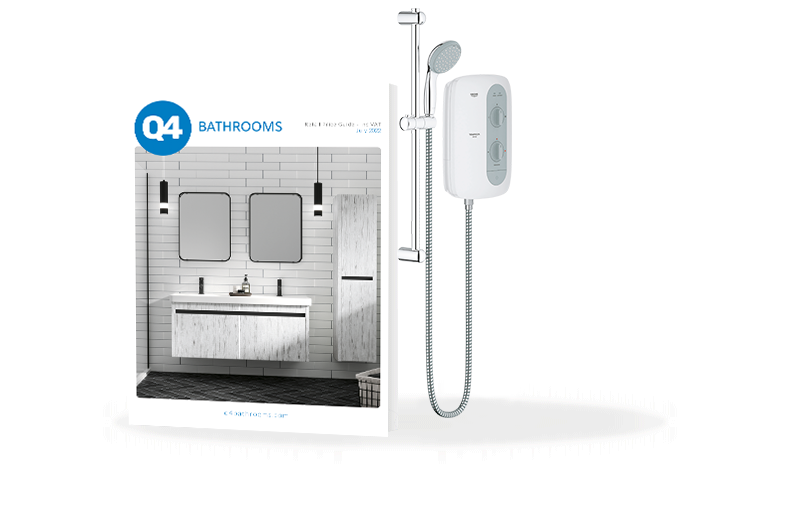 Establishing and maintaining a strong working relationship with leading companies such as Grohe and Linea, Q4 is able to offer more choice and variety in showers and shower heads than ever before. Get the most out of your showering experience and browse through our range of shower heads and valves to find the design that meets your requirements. Our collection of top quality showers offer a mixture of body jets, diverter valves, or ultra modern waterfall heads. Our products come with safety features to ensure the water temperature won't fluctuate to the point of scalding, and offer high performance while remaining eco friendly. Electric showers from Grohe are built to last; a silicon ridge protects the shower head from knocks and bumps, the long-life shine finish is resistant to soil and tarnishing, and an inner water guide makes for a longer life for the hand shower. View our brochure for details. Why buy showers and shower heads from Q4?